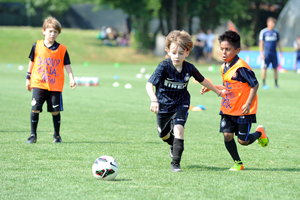 Inter Academy is the international expression of our Club’s Academy, which has been very successful in recent years thanks to a deep know-how on and off the pitch. This success is built on a very clear pillar: we want our kids to become excellent men first and then champions. The ethical responsibility we have is taken in great consideration not only by the Academy, but also by the Club as a whole. In this respect, the Club adopted a code, “Inter Corporate Policy for Children”, created for the compliance with international and Italian principles on child protection. Respect for others, active participation in the life of the group, exchanging ideas and sharing in victory or defeat, as an individual and collective learning experience, all play a central role in our Academy. Our kids will become excellent citizens and brothers of the world. The technical connection between the Academy based in Milan and the other centers is the foundation of the youth sector and what makes Inter unique. Every Academy we have in the world is an extension of the Club and the people who are involved abroad are the same who are part of our Academy based in Milan. Several activities are undertaken every year to strengthen this relation and to improve our Academies worldwide. The technical focus is at the core of the project and we proud ourselves of the standards of our coaches, who are part of the main academy network since many seasons, before starting to coach in our international academies.